Noah 40 Shebib will be getting a lot of blame, but also... Pusha T is a weirdo? 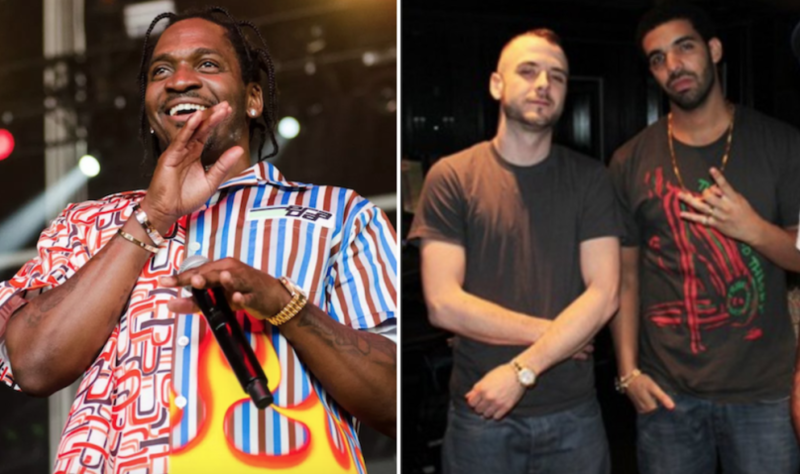 One of the shining moments of pop culture from this year had to have been when Drake released a fairly innocuous diss track about Pusha T, and Pusha T slammed back with an insane and intense rap dissertation for why Drake is not fit to walk on this Earth. Explored were subjects including Drake’s strained relationship with his father, a photo of Drake wearing blackface was used on the cover, and a revelation about the existence of Drake’s secret son, Adidon. It was a harrowing bit of revelation for the pop star, and since then the mystery has abounded: who provided Pusha T with the information to make the rap equivalent of the Black Canary scream directly at the soul of Degrassi’s own? Kanye was blamed for a hot second, and even released an apology for it, but Pusha T, on the The Joe Budden Podcast, revealed that it was not Kanye who released the info, but in fact it was Drake’s producer and friend, Noah 40 Shebib. Here is the clip of the revelation below. It turns out that Noah, Drake’s confidant and co-worker, was sleeping with a woman to whom he was also sharing bits of his life — including the trips, birth and experience of caring for Adidon. When Pusha T was researching the diss track, he discovered this woman and began to pry information from her. Far be it from us to point out how this is the same method of information gathering that Russian and American spies in the Cold War employed using the “Honey Pot” method, but we will say that this makes Pusha T seem like a real creep. Pusha T is out there doing some creepy spy work, the social equivalent of digging through other people’s garbage, and then throws Drake’s producer under the bus for it. It is also possible that Pusha T is making this up to mess with Drake more, although that would just be conjecture, and for all we know Pusha is just a garbage digging creep and not a manipulative creep. Remember everyone, never speak to anyone. Lose lips sink ships. Warn your children. Pusha T is in the rafters. Listening. Watching. Ready to write a diss track about the life you pathetically don’t want the entire world to know about. Guard your eyes. Pusha T comes for thee. So Pusha T revealed Drake has a son who he is absent for, and also revealed he’s the kind of guy to shake down the lover of a producer to get secrets on an enemy to embarrass him on the national stage. Everyone lost. What do you think about all of this nonsense? Let us know in the comments or on Twitter at @WhatsTrending.